Announce a "Slime Day" for your students and you're quickly on your way to teacher fame! Great for birthday parties and scout groups too. This kit comes with everything you need to make 32 2 oz. (64 ml) batches of perfect slime. 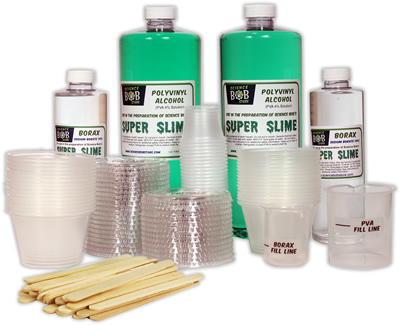 Choose between mixing with the included stick, or use the cups and lids to shake up your slime mix to perfection. An added preservative also helps the slime last longer. Our slime is designed for learning and fun and it can be picked up, slowly stretched to over 4 feet, and can even be rolled into a ball. Students will learn about states of matter including liquids and polymers. Then they can take their slime home in the included labeled containers. For ages 6 and up with adult supervision. "Definitely the best thing my six-year old has ever made with chemicals." "They loved it, a great learning experience." "As teachers, we liked the ease of use, the clear instructions, and the fact that everything we needed was included." "Thank you for such a memorable lesson! One of our students commented, 'This is the best science class, ever!'" I bought classroom kit for a birthday party and the children thoroughly enjoyed making their own slime! It was a HUGE hit! Will definitely buy this item again. We used the Classroom Slime Kit for a lesson about the states of matter and polymers. The instructions were clear and the process was fun and easy. We will do this again for sure. We use the classroom slime kit each year during our Halloween Science Party. The kids really enjoy it. It can be a bit sticky right after mixing, but after a minute or so our 3rd graders can stretch the slime as wide as they can stretch their arms.